Since 2008, French base wages have been increasing in real terms at a rate close to 1% a year, whilst the unemployment rate has also been increasing steadily. One possible explanation for the small cyclical variations of wages relies on the existence of strong nominal and real wage rigidities that prevent wages from adjusting to shocks in the short run. In European countries, collective wage bargaining institutions are claimed to be responsible for such wage rigidities (e.g. Boeri 2015). Thus, the recent crisis led some European countries like Portugal and Spain to implement structural reforms of their collective bargaining systems (Martins 2014, Villanueva 2015). In France, as in many other European countries, a very large proportion of workers are covered by industry-level wage agreements which set wage floors for different representative occupations (see Visser 2013 for a recent survey). Industry-level wage floors are then binding for all firms and are used as references for firms’ wage policies. By law, these wage floors cannot be set below the national minimum wage (“NMW” hereafter). Since the NMW is automatically adjusted every year and affects directly between 10% and 15% of the labour force, a large share of industries update and increase their wage floors every year, which can induce NMW spillover effects to wages higher than the NMW, sustain sizable wage increases, and generate wage rigidity at the aggregate level. Even though industry-level agreements cover a large share of workers and are one of the main references for firms’ wage setting decisions, little is known about how wage floors are defined in industry-level agreements. In recent research, we investigate how wage floors are adjusted in France and to what extent wage floors can be a channel for spillover effects of the NMW to other wages (Fougère et al. 2016). France, but also many other European countries, has a two-tier system of collective wage bargaining (e.g. Boeri 2015), where collective wage agreements at the firm level are only possible if they improve wage floors defined by multi-employer sectoral wage agreements. This multilevel system of wage bargaining is intended to allow firms to adjust to shocks at the micro level but also to prevent excessive wage dispersion at the macro level. In France, all firms are classified into one of the 700 different ‘contractual industries’ (branches conventionnelles). Only 300 of these industries cover more than 5,000 workers each, and bargain on wages on a regular basis. In every industry, a general collective agreement (convention collective) defines general rules and principles governing industrial relations between employees and employers within the industry (working conditions, duration of work, severance pay, union rights, etc.). It also defines an industry-specific classification of representative occupations, and all workers in an industry are assigned to one position of this job classification. A wage floor is set for every position and workers at a given position cannot be paid below the corresponding industry-specific wage floor. Industry-level wage agreements generally update values of wage floors and define the date at which new wage floors should apply to workers. As in many European countries, industry-level wage agreements are extended by the Ministry of Labour to all firms of a contractual industry. Those extensions are quasi-automatic and generally quickly implemented. Finally, contrary to some European countries (like Germany), there is no opt-out possibility for French firms, and industry-level wage floors are binding for all firms in an industry. Besides, the binding NMW (in French, Salaire Minimum Interprofessionnel de Croissance, or SMIC) is expected to shape the wage floor adjustment process, since it defines a legal wage floor for all French workers. The NMW is automatically adjusted every year, on 1 January since 2010, and NMW increases are decided by the Ministry of Labour following an explicit and legal rule - the nominal increase of the NMW is equal to past inflation plus half the past purchasing power of blue-collar workers. This automatic increase can be augmented by a discretionary increase decided by the government (the last example was an increase of 0.6% decided in July 2012). When the NMW increases, industries have strong incentives to bargain new wage floors to adjust the lowest wage floors. In addition they may receive strong recommendations from the Ministry of Labour to open industry-level wage negotiations and update their lowest wage floors. Moreover, wage floors above the NMW might also be affected through spillover effects. In particular, to maintain the effort of better paid workers or to attract better workers, industries have incentives not to reduce wage differentials too much after an increase of the NMW and so to increase wage floors higher than the NMW (Grossman 1983, Manning 2003). How did industry-level wage floors adjust in the recent period? In our paper, using individual wage floors collected for about 350 industries in France over the period 2007-2015, we are able to compute the aggregate year-on year growth of wage floors negotiated in industry-level agreements. Between 2007 and 2009, wage floors rose by more than 2% on average, while inflation and minimum wage increases were higher than 2%. Then between 2010 and 2013, wage floor growth slowed to 1.5% on average and since 2013, the average wage floor growth is close to or less than 1% in a context of low inflation (see Figure 1). However, in real terms, wage floors increased every year by about 0.7% in the recent period, despite the rise of unemployment. Another finding is that wage floor growth is closely related to aggregate base wage growth but is smaller, since base wage increases also include firm-level and individual wage increases. Moreover, in 2008 and 2012, when the NMW increased by more than 2%, the gap between the growth of wage floors and the base wage growth narrowed, suggesting spillover effects of the NMW on wage floor growth. When we look at the distribution of individual wage floor increases in the recent period (see Figure 2), we first observe that the share of wage floor variations that are equal to zero (namely, when there is no agreement in a given industry) increased from less than 15% in 2012 to about 35% in 2015 because of the lowering of inflation and smaller NMW increases. Moreover, the entire distribution of wage floor adjustments shifts to the left – more than half of non-zero wage floor adjustments were between 2 and 2.5% in 2012 whereas most wage floor increases are between 0.5 and 1% in 2015. 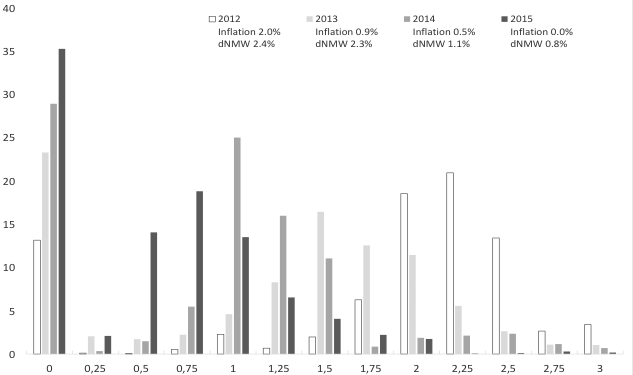 In a given year, the mode of the distribution is always very close to the inflation rate or the NMW increase. Source: Fougère et al. (2016). 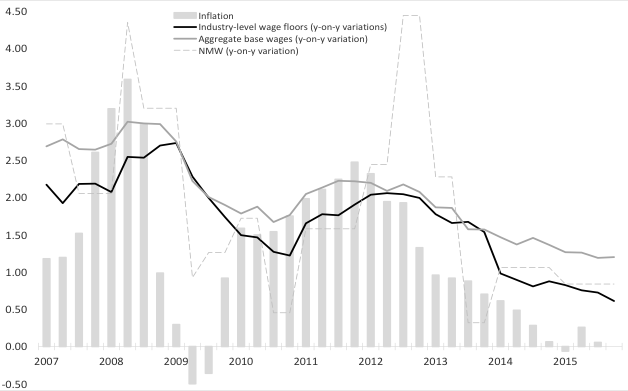 When we relate wage floor adjustments to NMW increases, we find that the timing of the NMW adjustment affects the timing of negotiations at the industry level – industry-level wage agreements are bunched around the date of the automatic adjustment of the NMW (in January since year 2010). Moreover, NMW increases have a positive effect on wage floor growth. An increase by 1% of the real NMW raises wage floors by about 0.25%. We also find a strong correlation between past inflation and wage floor increases (with an elasticity equal to 0.6) which might capture a ‘direct’ inflation effect on wage floors and a more ‘indirect’ effect coming from the NMW indexation to past inflation. Finally, the elasticity of wage floors with respect to real NMW variations decreases along the wage floor distribution, but only slowly – from 0.4 for the lowest wage floors to 0.15 for the highest wage floors (see Figure 3). A similar downward slope is obtained for the elasticity of wage floors to inflation. These findings prove the existence of minimum wage spillover effects to all wage floors, even the highest ones. 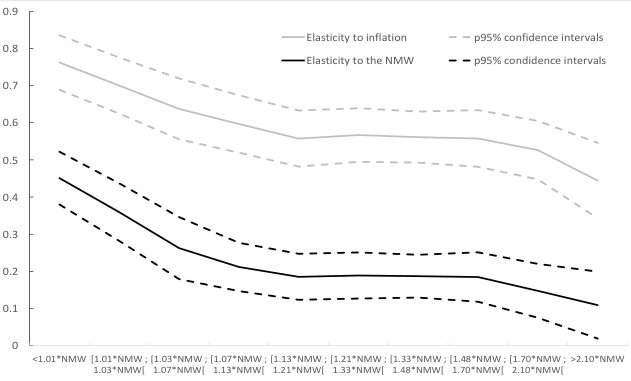 Industry-level wage floors are a channel of transmission of NMW increases to other wages in France – NMW adjustments strongly affect the timing of the bargaining process and its outcome. This might suggest that bargaining institutions can explain, at least partly, the small response of aggregate real wages to the rise of unemployment during the Great Recession. Further research linking dynamics of wage floors and individual wages should help to understand how strongly wage bargaining institutions have shaped actual wage dynamics during the recent crisis. Manning, A (2003), Monopsony in Motion: Imperfect Competition in Labor Markets, Princeton, NJ: Princeton University Press. Visser, J (2013), “Wage Bargaining Institutions – from Crisis to Crisis,” Economic Papers No. 488, European Economy, European Commission Report.